It just so happens that I have a very sweet quilt to share with you today... my Sweetheart Quilt! 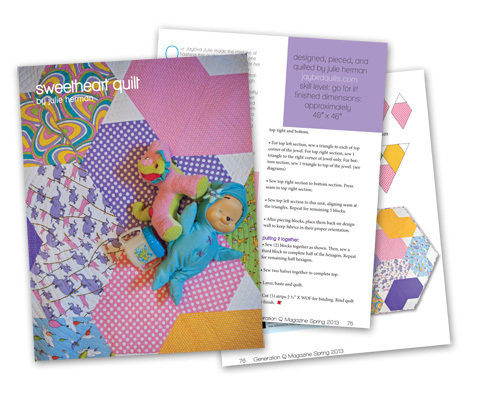 Quilt measures - 40" x 46"
The Sweetheart Quilt pattern is in the Spring 2013 issue of Generation Q Magazine. 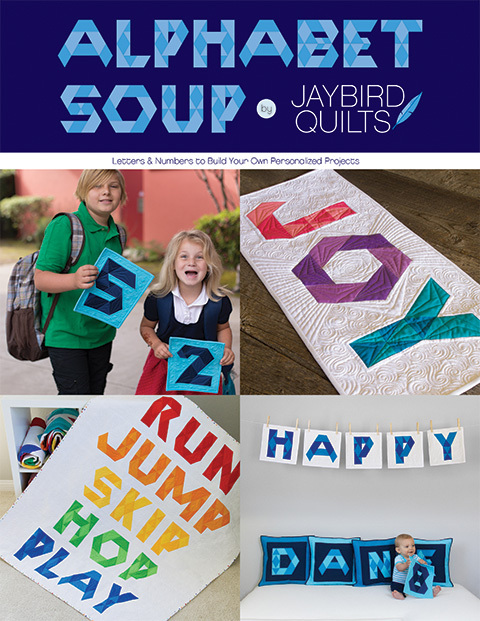 It just started popping up in Quilt Shops a few days ago and will be on newsstands soon. The pattern uses my Hex N More Ruler & I also included templates in the magazine too. I originally designed and made this quilt for Aliyah. It was supposed to be a present before her new baby brother arrived. 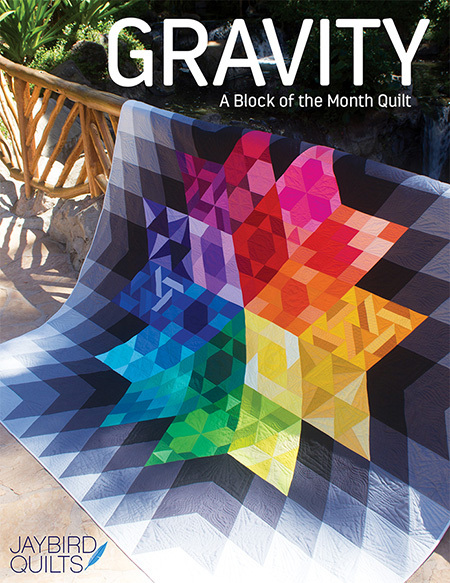 You'll have to read the article in GenQ to find out how they ended up with the quilt!! I couldn't resist photographing it with our Radio Flyer wagon. The wagon is forever a classic just like the book Oh, the Places You'll Go by Dr. Seuss!! I love that book and look forward to giving this quilt to Aliyah. To make this quilt you need 9 fat quarters, background fabric & binding. I used the 9 fat quarters in this bundle and saved the panel for another project. 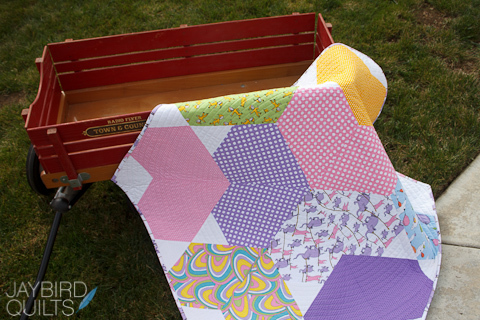 One lucky reader will win a kit to make their very own Sweetheart Quilt!! 1. A Hex N More Ruler. 2. A copy of the newest issue of Generation Q Magazine including the Sweetheart pattern. 3. A Fat Quarter Bundle of Oh, the Places You'll Go by Dr. Seuss provided by Robert Kaufman. You can choose the pastel bundle I used in my sample or the bright bundle. That is over $65 of goodies!! To enter leave a comment and tell me what your favorite Dr. Seuss book is and why! 2. In your comment tell me what your favorite Dr. Seuss book is and why!! My favorite is book is Oh, the Places You'll Go because it inspires me and reminds me that with hard work I can do anything!! You have till 9PM PST on Sunday the 17th to enter. My favorite is One Fish, Two Fish, Red Fish, Blue Fish. I remember my Momma reading it to me when I was little. I passed that same book on to my kids, and now soon my first grand baby. This would be perfect to make for her. I like Fox in Socks dont now why. I love you pattern. Have a nice day. Green Eggs and Ham cause it is just weird. Happy quilting! My favourite is Oh, the places you go, because I am living in another country at the moment and this book helps me to think positive and get through the difficult days! I love all his books, I have such fond memories of them from when I was a kid, and my kids have a few of their books, and love to read them. Happy Valentines Day Juile! Long time no speak, I hope all is well with you. And i hope you are feeling better. My favorite is a toss up between The Lorax and How the Grinch Stole Christmas. Both were great books with a positive message. My favorite has to be Horton Hears a Who, it is sort of sad... But as a kid, I loved the idea that there could be a whole world on a flower. Wow, such a hard choice they're all awesome. I'd probably have to go with How the Grinch Stole Christmas. I top my tree with a Grinch and am actually in the process of collecting Grinch ornaments to make a Grinch tree. 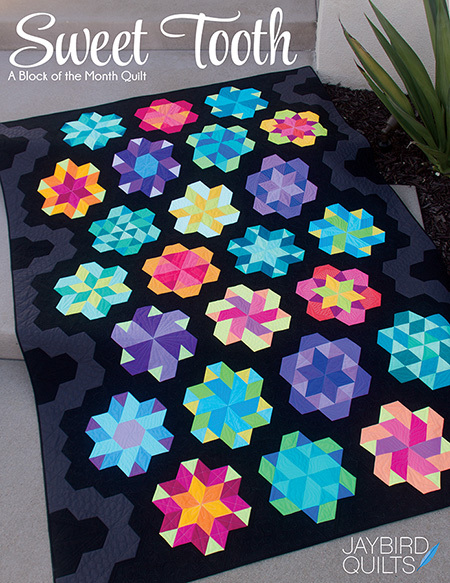 Gorgeous quilt - would love to make one of these. My favourite Dr Seuss book is Oh, the places you'll go, just because I think it gives children the idea they can do anything if they try. I love Green Eggs and Ham! green eggs and ham after we read it. The only Dr. Seuss book I have read for my kids is Hop on Pop, so I guess that will have to be my favorite. Another fun thing is that I used black-on-white Dr. Seuss fabric for Bonnie Hunter's mystery quilt 'Easy Street' this winter. Thanks for comp, I like Fox in Socks. Love your ruler, I am making a Baby Lotus at the mo, so easy and pretty. My favorite is The Cat in the Hat because (many years ago) when I would read it to my son he would always ask me to read it again. That time with him snuggled on my lap was the best! Oh the place you'll go is a great a favorite book. Love the whole bundle of goodies. I love The Sneeches and Other Stories. I can recite all 23 Daves would-be names. Thanks for the giveaway! Happy Valentine's Day! I'm gonna have to go with Green Eggs and Ham, just because of the Sam I Am parts :-). Thanks for the give away! My favorite book is Green Eggs & Ham simply because it reminds me of my children when they wee little. I would read the book and they would quote it from memory. Such fun. Thanks for a great giveaway. What a lovely prize package! Thank you for the chance to win. My favorite book is one from when I was a child...One Fish, Two Fish. I could read that over and over! All of them bring back wonderful memories of the childhood of my children. I think they loved The Grinch best of all, and we never missed the showing of it at Christmas, now I read them to my great grandchildren..memories..thanks for the great giveaway. Love all your work, Julie..this Valentine quilt is adorable..
Oh my! I absolutely love that quilt, it's precious! My favorite Dr. Seuss book is Horton Hears A Who, because it reminds children that they're important and can make a difference no matter how great or small. Green Eggs and Ham - just has a nice ring to it when you read it! 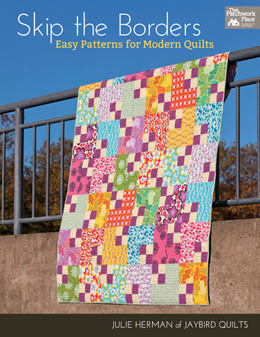 And what a nice surprise to wake up to on Valentine's - great quilt pattern! Happy Valentine's Day to you, and hope you're feeling better. My favorite Dr. Seuss book has always been The Grinch, because do the message and my favorite non-Christmas book would be One Fish Two Fish Red Fish Blue Fish simply because of how it rolls off the tongue. What a great giveaway!! I love your quilt. I have two favorite Dr. Seuss books. One is Oh, The Places You'll Go, because my daughter requested that me & her dad/my DH write in it for her college graduation. The second is Horton Hears a Who, because when I was in early elementary school, my parents signed me up for a French class. To get in, we had to remember to say, "Bonjour Mademoiselle Whatever Your Name Is". I could never remember that, so went into the room with all the Dr. Seuss books, and Horton was a favorite read. Green Ham and Eggs Definetly. I have fun reading this to my Grandkids. We laugh and have fun together with this story. I love the quilt pattern. I hate to admit it, but I don't care for Dr. Seuss. 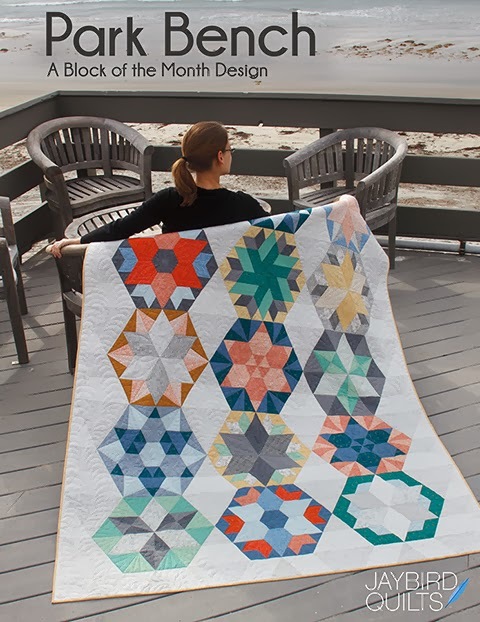 I do, however, love this quilt kit giveaway! I was a school librarian for seven years, so it is very hard to narrow down to one choice. If forced - I would say The Sneetches because it is a hilarious book, but gives such an important message about not judging by outside appearance. A very good book to use to fight the "us" and "them" mentality - but all wrapped up in fun! thanks for the amazing giveaway!! Hope you are on the mend!!! Love your heart quilt! I appreciate heart quilts that aren't too heart-y. My favorite is The Cat in The Hat Comes Back. Mostly because I discovered this week that my not-quite-2-year-old can recite it in its entirety. "Cat! You get out! There is work to be done!" One fish Two Fish Red Fish Blue Fish is my favorite because I read every day to my grandson! He loves pointing to the different sayings! Thanks for the great giveaway! My favorite it is Green Eggs & Ham. I have a video of my son trying to read it when he was 3, cutest thing ever. It seems to have been a favorite for all three of my kids too. I love If I Ran The Circus, the imagination that must have been behind the story, all the crazy whimsical characters! And I really love how it reads in verse! Can't believe I have to choose. Ok my favourite would have to be the Lorax because who can resist a funny fluffy fellow that speaks for the trees. Beautiful quilt design. I love The Lorax. I like the environmental message and it was one of the first books I remember going to the library and getting for me to read to myself. Love the quilt it is so bright and cheerful. The most applicable to my life today is I Am Not Going To Get Up Today. I think it sums up a case of the Mondays well! The first one to pop into my head, though, was Yertle the Turtle. I always liked the message, even if I was guilty of disobeying it frequently. Have to be Dr. Seuss' ABC Book. My daughter at age 2 could recite that book from memory and learned her ABC's on that book. She is now almost 21. It was by far her favorite which in turn has alot of memories for me. Beautiful quilt. Thanks for the chance. My favorite Dr Seuss book is "Go, Dog, Go!" because it was read to me as a child and I read it to my daughters and agin to their children. Now my grandchildren are reading it to me over and over. Hopefully, I'll get to repeat the process with my greats! The Cat in the Hat Came Back...it's my boys favourite. We've had many snuggly moments before bed reading it. Great memories. Thanks! I love the Cat in the Hat because it's the first Dr. Suess book I ever read and it brings back a lot of memories. I'm now reading it to my granddaughter. Thanks so much for the giveaway and for your fun blog! When I was little I loved The Cat in the Hat and Green Eggs and Ham but now that I'm a mom and have read so many of his books over and over again it's hard to pick a favourite. One Fish, Two FIsh, Red Fish, Blue Fish is one that everyone in the family enjoys, so I'll go with it. Thanks for the great giveaway. Lovely quilt. My favorite is Hop on Pop, because it is the first book I ever read all by myself! Thanks for the giveaway. I love The Lorax because he speaks for the trees. What a great way to teach kids to respect nature. One Fish, Two Fish, Red Fish, Blue Fish because of the memory of reading it to my daughter all the time. My favorite is Go Dog Go! My boys loved that one the most for me to read to them so I have lots of warm memories of time spent with them and that book. Beautiful quilt.I love the The Grinch,it`s bring me back to christmas time when I was a child. Green Eggs & Ham - I used to read this to my grandsons on trips and after a while we all started speaking that way - too funny. 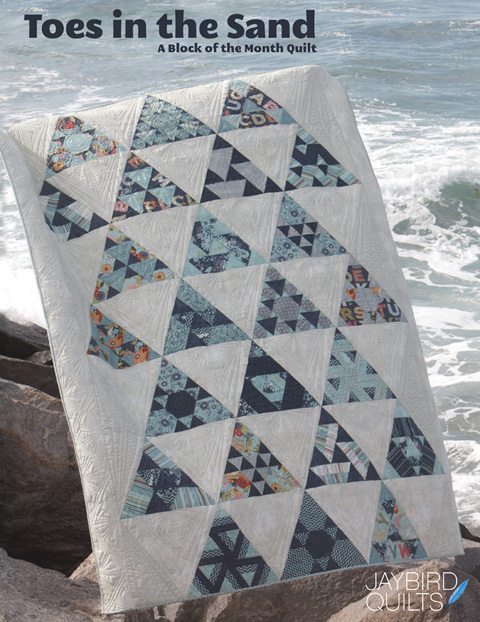 Love the quilt and would love to win. Thanks for your beautiful work. I have three littles so I read a lot of Dr. Seuss. I like Go Dog Go best, and don't like reading Fox in Socks much! My favorite Dr. Seuss book is "Horton Hears a Who", because a person is a person no matter how small. I love the book "on beyond zebra" about a big brother teaching his little brother about all the letters that come after z, and the animals who start with those letters. We had a very worn copy when I was little, but I've never seen it anywhere else. I have not read Dr Seuss books! I love all the Dr Seuss books, but especially One Fish, Two Fish, because it's the one that my son requested the most! thanks for the chance! My fav is green eggs and ham.I used to teach preschoolers and we would actually cook green eggs.The faces of those kids were priceless! Green eggs and Ham! I liked the repetition of it when I was younger and I always thought green eggs were funny. I don't know that I have a favorite but my little niece loves ducks so I will say I wish that I had duck feet. Any one of the books that you have to read aloud to a little one for the first time is a hoot. Green Eggs and Ham. I used to run a home daycare, and I would make Green eggs and ham for the kids each year. I read the book to the kids and did a whole theme on this for them. The kids really got into the book. If I am the lucky winner I would prefer the pastel. 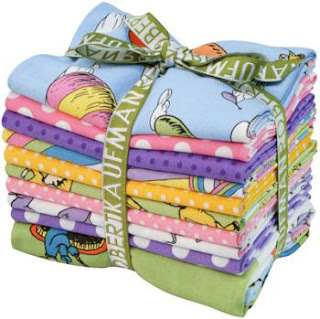 EEk!...I never was a fan of Dr. Seuss...(shudder, gasp) I know, I know...but I would love to get my hands on that bundle!!! Thanks for the chance! My favorite is "My Book about Me" - my parents gave it to me when I was about 7 and I filled in all the blanks (all in one day) and kept the book. I kept looking back at it over the years, and made sure to add it to my baby registry when my son was born. He now has his own copy he has started to fill in - and loves to read and compare to mine. I love The Places You'll Go since it can be associated with so many different events...birth, graduation, birthday. What a talented writer! Thanks for a great giveaway. One fish, Two fish is my favorite book. My girls always wanted me to read that book to them. Thank you for the opportunity to win. Love your patterns! My favorite Dr. Suess book is Fox in Socks because my daughter loved this book when she was young. We often read it multiple times in a single day. What a clever quilt! My favorite Dr. Seuss book is The Sneetches because it teaches that being who you are is good enough, chasing the latest trend &trying to be like everyone else is pointless. Those sneetches learn that it's okay to be different & still get along. I think I also learned to be a careful consumer from that book. I love all the Dr. Seuss books, as did my four daughters. My two and a half year old grandson's favourite is Hop n Pop, we read it together a lot! Thanks for the giveaway! Love your quilts, BTW! It has to be One Fish! Love the quilt! One fish, two fish because I could "read it" when I was 3!! My favorite Dr. Seuss book is Oh the Places You'll Go. This is the book that my daughter's 5th grade teacher read to her class when they had their promotion ceremony. I have always remembered the time she took to read it and the encouragement she gave the kids as they move up to middle school because middle school is a bit scary these days. I love the cat in the hat - it was my son's favourite! I am a fan of all the Dr. Seuss books but The Cat in the Hat is my favorite. 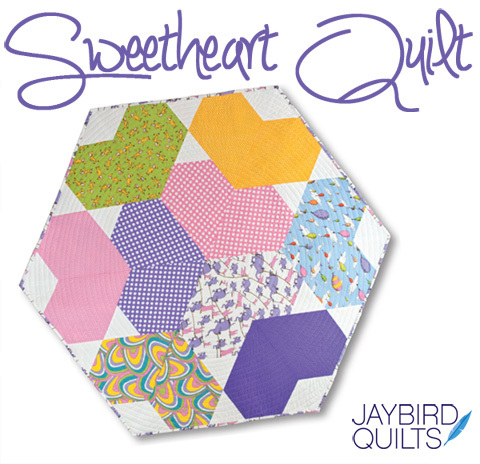 I love your Sweetheart quilt pattern and the hexagonal shape of the entire quilt. My favourite Dr Seuss book is Green Eggs & Ham because it encourages us to try new things. I rarely make the same pattern twice, always want to try something new. Love your design! In The Sneetches there is a story about Mrs.McCave and her 23 sons all named Dave, that is the best. And I also love the movie The 5000 Fingers of Dr.T. Just one favorite? That is difficult...i love the cat in the hat, but also the lorax, and green eggs and ham, and more! We're getting ready to celebrate dr. Seuss' birthday in my clssroon in a few weeks! I love Oh the places you'll go. It's such a great graduation gift and really inspires me. I love hop on pop! My dad read it to me as a child! I think it was his favorite too! I just finished one of my favourite books (well reread it): THE SHADOW OF THE WIND by Carlos Ruiz Zafon. The other favourite book I want to read but could not find my copy is A PRAYER FOR OWEN MEANY by John Irving. Mr. Brown Can Moo! Can you? I read that book so much to my daughter when she was little, we had to buy a second one since the pages all fell out. My favorite Dr Seuss book is Horton Hears a Who, like Horton I believe a person's a person no matter how small!Happy Valentine's Day, may your day be overflowing with LOVE! My favorite is the Lorax. I used to play the part of the Onceler at an Environmental Education camp in Ohio. We performed during campfire and loved getting the youth playing various parts as well. I loved reading Green Eggs and Ham to my little sister as she used to giggle like crazy over the silliness. Go Dog Go! is a current favorite at my house and it has been in the rotation for about a year. It was one of the first books that my daughter seemed to enjoy and she still does! The Lorax... I read this book so many times to my kids, I think I have it memorized. I like "The Cat in the Hat." It is so zany and crazy and I loved reading it with my children. Thanks for the opportunity to win your generous giveaway. "The B Book" is my favorite....because it was the first book I remember reading all by myself when I was 4. I have every Dr. Suess book available in my (my kids') collection! Thanks! Our family fav was green eggs and ham and once in awhile we would have to have green eggs and ham for breakfast. Dr. Seuss is a treasured friend at our house. Thanks for sharing your talents. My favorite is The Sneetches :) because it highlights the fact that at the end of the day, all the differences that seem to divide people are arbitrary. We're all Sneetches, stars on our bellies or not! The cat in the hat, because my little sister loved it and wanted me to read it over and over! Then the Grinch made an impression. loved the books! Green Eggs and Ham. It's a classic from my childhood, and I loved the thought of green eggs. Guess I was already into color way back then! Cat in the Hat because my son laughed every time. It made him happy. He's now 32! I love the Cat in the Hat. His books always make me smile. My favourite is "I Had Trouble in Getting to Solla Sollew." It was the first Dr. Seuss book I ever owned and its all about learning to face your troubles instead of running away from them. I LOVE the message of that book. Oh! The Places You'll Go is my favorite book! I've been so excited for this fabric line to come out. I love this book because my parents gave it to me when I graduated from high school. It reminds me that things may be unknown and hard to make it thru, but will you succeed...98 and 3/4 percent guaranteed! Thanks for the chance to win some of this great fabric. Love your blog and all the creativity you share with us. I love the Sneetches becuase it has a wonderful message that everyone needs to be reminded of. My favorite Dr. Seuss book is Green Eggs and Ham because it is the first one I remember having read to me. One fish two fish red fish blue fish! We are constantly quoting it. What a great giveaway. My favorite book by Dr. Seuss is Mr Brown Can MOO! Can you?. I read this book to both of my kids and I loved hearing them giggle to the funny noises! I really don't have a favorite. I really love the meanings of all the books. But, my granddaughter just started reading and it has been a lot of fun having her read to me she likes Hop on Pop! My favorite Dr. Seuss book is "The Foot Book" because it was the first book my oldest son ever read to me all by himself! I really like Green Eggs And Ham, it's my son's favourite and I've been reading OT to him for a long time and now he can read it himself! I like the Cat and The Hat because it always seemed amazing that all those things could happen when your parents are not home. Thanks for the giveaway and congratulations on another wonderful pattern. It would be Green Eggs and Ham it is just the cutest story and the grands always want to hearit! I like the Foot Book. I teach kindergarten and we have the children measure their parents feet and then graph to see whose is bigger. Then they bring it to school to share. They love doing this. I absolutely LOVE The Lorax. My husband and I took our oldest granddaughter to her first movie theater movie. I don't know why The Lorax touched me so deeply. Anything Lorax reminds me of that day with our grand daughter. Thanks for the chance at this awesome prize! Dr. Suess is my very favorite author of all time! It's a toss up between One Fish Two Fish and Green Eggs and Ham because I taught my sister to read with those books when she was four years old. Gotta go with Green Eggs and Ham. Cheers me up every time and gets me ready to face anything. I know we (my sister & I) had a ton of Dr. Seuss books when we were little but sadly I can only remember the most popular ones like; Cat in a Hat, Green Eggs and Ham...Sam I am! Guess I would have to Say Green eggs and Ham! Yertle the Turtle is my favorite. It reminds me to be appreciative for all the support I get. There are so many it's cruel to make me choose just ONE....but the "Grinch that Stole Christmas" will probably always be my true favorite! I love if I Ran The Zoo. I love it for its out of the box thinking. I love Green Eggs and Ham! What a great new pattern. Thanks for the chance to win the kit! I think my favorite is Go Dog Go! mainly because of the way my parents each read it - with enthusiasm! I also loved the one where they keep asking "Do you like my hat?" I loved the illustrations. Ohh, I hope I win your great giveaway! Go Dog Go! because my dad read that book with enthusiasm. my siblings and i loved it! My favorite Dr. Seuss book is The Lorax. I like the "Unless" Unless someone cares a whole awful lot, it's not going to get better. I love Dr. Seuss books so picking a favorite is difficult. Probably The Grinch though because it shows that kindness and faith can help one overcome evil. My favorite Dr. Seuss book is Green Eggs and Ham. As a child I was an extremly picky eater and this book still reminds me that even if the new food doesn't look great it can still taste wonderful!! "A Great Day for Up" for it's reminder of one's endless possibilities. It's hard to choose, but I feel like The Lorax has such a great message that stands the test of time. And teaching kids about caring for the environment is so important. Thanks! "Oh the places YOU are Going" couldn't resist to wish you a Happy Valentines Day here.....You are SO special! If this quilt wasn't going to Aliyah, I'd put dibs in for it! Love it & Love You! I love Green Eggs and Ham! (My brother was a One Fish Two Fish Blue Fish fan, so I heard that one a lot two). I love the fabric, so awesome! Crossing my fingers. I adore the Cat in the Hat book because I love Thing One and Thing Two. Sam I am. I like it because my initals are SAM. I love "one fish two fish red fish blue fish". Because "every day here and there funny things are everywhere!" Thanks! They are all classics, but my favorite would have the be "How the Grinch Stole Christmas". That one is truly a classic! Thanks for the fantastic give-away! It's hard to choose just one... I'll have to go with Green Eggs & Ham since it gets the most lines repeated around our house. Thanks for a great giveaway! And it is not too long. Some of his books are TOO long. When I was a kid, my sister's dance teacher had them do a dance to that book. She was "here come clown feet". My mom spray painted a pair of her old sneakers green for my sister to wear and clomp around in. I love "Oh the Places You'll Go!" Oh the Places you'll go is my favorite too-I read it to my son all the time! 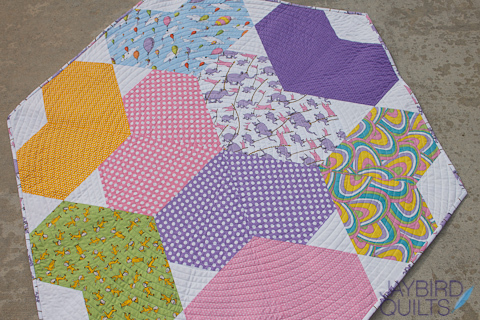 Your quilt is so cute, and I may have a new grandbaby soon.... so it would be perfect! My favorite is Bartholemew and the Oobleck. I remember reading it a bunch as a child and I always thought it was so fun. I also like it because it isn't one of the most well known Dr. Suess books. I love all of Dr. Seuss, but Green Eggs and Ham and How the Grinch Stole Christmas are my most favorites!!!!! My favorite is "Mr. Brown Can Moo, Can You?" My mom used to read it to me all the time when I was little. Now I've got twin one year olds and this book is the one that holds their attention the longest. They love hearing all the different sounds. Love that pattern. My fave Dr Seuss is The Cat in the Hat. My children both loved it and it reminds me so much of snuggled up storytimes. One of my favorites is "Hop on Pop" because my son learned to read with it. My favorite is The Cat in the Hat, because it was the first one I ever read. I LOVED the blue cover, and the red. I don't know why, but I just was aesthetically drawn to that book. I read it so many times, I had it memorized. I LOVE that book! I love One Fish, Two Fish, Red Fish, Blue Fish, it was one of the first books that both my daughters could read on their own. The Lorax! I thneed is a thing that EVERYONE needs! Such a hard choice, but as a child I loved the Lorax. It was one of the few books that I could listen to over and over. Green Eggs and Ham is my favorite. It reminds of together time I had reading it to my now grown sons. Would love to win this give away! Lovely blog! Just found it today in my hunt for good quilting blogs. My fave Dr. Seuss book is Mr. Brown Can Moo, Can You? I've read it to my oldest son repeatedly, and each time he starts giggling and squealing, and I enjoy seeing him so happy. My favorite Dr. Seuss book is Go, Dogs, Go because it is all about the dog party. One of my three girls had it memorized and almost convinced us she could read at a very young age. My favorite is 'The Cat In The Hat",as it was the first I read to my children! Thanks for sharing a beautiful giveaway! I really love Horton Hears A Who, just because I remember reading it to my children, and now my grandkids! My favorite is still The Cat in the Hat! I love the rhymes. Making this would be lots of fun. It has to be Go Dog Go because they wear party hats. My girls are teenagers now, but we all still say," do you like my party hat?" And giggle. Memories. My favorite Dr. Seuss book is the Lorax. I live in BC, Canada and forestry/logging is a HUGE industry here. To me, it hit close to home that we have to respect the land and what it can give us. Look after the land and it will look after us. I remember Green Eggs and Ham from when I was a kid, but my favorite is the Grinch because of Max, his dog. I love Green Eggs & Ham because I love to play trucks on my children. And them back on me. We will also say "I'm not touching you." While holding your finger just an inch away. My favorite book is "Green Eggs and Ham" because I enjoyed the rhymes while reading it to my children and now to my grandchildren. P.S. Luv that quilt, so cute! My favorite book is Oh the Places You'll Go. I love it because it is great for any graduation from kindergarden to college. I love Green Eggs and Ham! It reminds me of my childhood when my mom would read to us. I love The Sneeches. As an adult it is because it teaches children that you don't always have to try to be like everyone else. As a kid...just loved hearing the phrase "Star bellied Sneetches had bellies with stars. Plain bellied Sneetches had none upon thars." My favorite is Green Eggs and Ham. I had it as a recording when I was a child and I loved the rythm of it! "The Cat in the Hat". I had a copy as a child and read it over and over again. I just love the characters and the rhyming. Great giveaway! I probably read Green Eggs and Ham to my son a million times. Now he's reading it to his son. Love the pattern - like all your others! One of my favourites is 'If I Ran the Zoo'. I can't imagine the number of times I've read Dr. Seuss books since I had five boys who always loved to be read to. This book was one that they enjoyed when they were 'too old' for the younger Seuss favourites like 'Cat in the Hat' and 'Green Eggs and Ham'. My favorite Seuss book is Oh The Places We Will Go! I gave this book to my son on his high school graduation day. I always taught him to be positive and keep pushing forward no matter what. I am happy to say he still has his copy of this book and now reads it to his students to encourage them. What a blast it would be to win this fabric and make him a quilt for his classroom! My favorite one is "Oh the Places You'll Go." It makes a great gift for high school or college graduation! Green Eggs and Ham, my boys have learned a good lesson from that book. Horton hears a Who!- My son had the lead in Seussical the Musical a couple years back and will always be my favorite. Though I do like Green Eggs abd Ham- can't remember how many times i read that to the kiddos!